On May 12th 2008, a 7.8 magnitude earthquake struck China’s Sichuan province. With over 30,000 victims, the scope and scale of this tragedy has shocked people all over the world. In response, Three Shadows is bringing together friends and family for a united effort benefiting the earthquake victims. 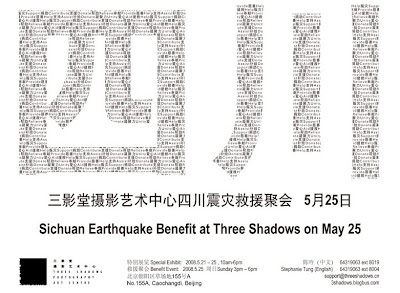 A fundraiser, including charity sale and silent auction, will take place in Three Shadows’ fourth exhibition hall, concluding with a special Sichuan Earthquake Benefit on Sunday, May 25th. In addition to a donation box for collections, Three Shadows has called upon its widespread network of artists and creative individuals for artwork, signed publications, and special classes to donate to the charity sale and silent auction. All profits from the event will be given to the China Red Cross for earthquake disaster relief. When one person is in trouble, many people can help. Three Shadows hopes you’ll get involved! The Three Shadows Fundraiser is accepting donations for the charity sale and silent auction immediately. Any items – artworks, books, gift certificates, etc. – are welcome. Beginning on May 21st, Three Shadows will exhibit the donated items in the exhibition hall. Items will be collected through May 25th, the day of the Sichuan Earthquake Benefit. Please contact Three Shadows to coordinate donations. These People Need ALL of Our HELP!